Picture these too-common scenarios: Fido is chewing on a rawhide, his absolute favorite treat; you walk past him to get to the laundry room, and he growls repeatedly until you walk away. Fido is eating dinner voraciously from his bowl when your toddler toddles past; Fido growls and snaps at your unsuspecting 2 year-old. Fido is outside, chewing on a tennis ball, when your other dog Fifi runs over to play; Fido lunges and barks at Fifi to scare her away. 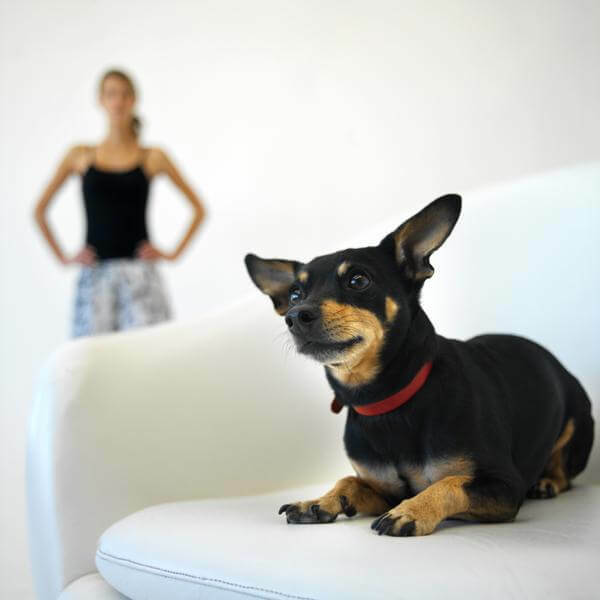 You’re comfortably reading on the couch, with Fido next to you; your husband sits down, and Fido growls until your husband moves to another seat.These behaviors seem quite frightening and yet they happen every day in many dog-owning homes. There is a name for this type of behavior: possession aggression or resource guarding. When certain dogs are “possessive”, they can become aggressive toward anyone they believe may be trying to come between them and their coveted items. 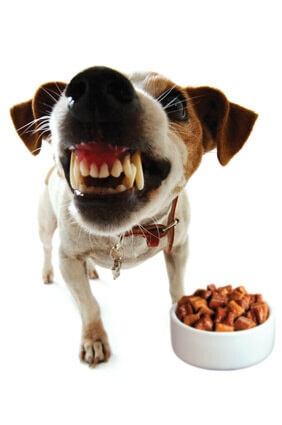 Possession aggression can involve food, treats/bones, toys, locations and even people. 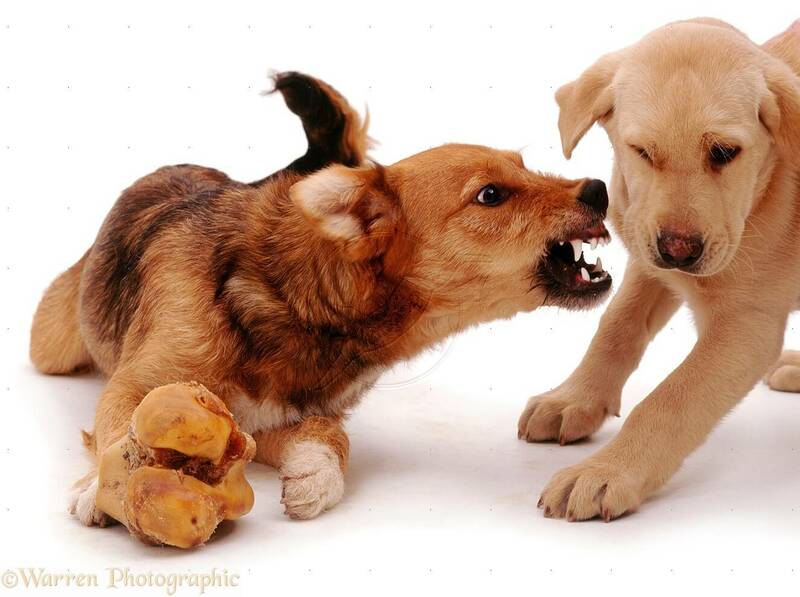 Some dogs show this type of aggression only toward other dogs (this is often the case when food or highly valued treats are involved); while not ideal, this behavior is less concerning than when people are the target of the aggression. 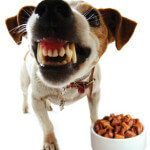 It is normal for dogs to defend their food, territory and pack from intruders. (If you’ve ever seen a Discovery Channel special about wolves, you’ve seen them display resource guarding to other wolves after killing a meal.) Unfortunately, while normal, this aggressive behavior is highly undesirable and can be downright dangerous in our domesticated canines. How do we address this alarming behavior? The first order of business: understanding that is never acceptable for dogs to growl at humans while “guarding” an object or person. It’s simply not OK for Fido to growl at you when you’re getting ready to tuck into bed for the night, and you disrupt his sleep. The second order of business: if Fido repeatedly displays guarding behavior around certain “resources”, then he has lost the right to those resources, with the exception of food. No, Fido doesn’t need to chew on a rawhide, if he growls at you when you try and take it away. No, Fido does not need to sleep on the bed or nap on the couch, if he snarls when you sit down. When Fido displays inappropriate and aggressive behavior around certain objects or locations, he has lost the right to those privileges altogether. It is essential to define boundaries for Fido, and limit his “rewards” unless he is behaving appropriately. Third, if Fido is aggressive to Fluffy the feline or Fifi the canine when eating, then all pets need to be separated when food is present. Close doors, and remove other pets (and children) from the location where Fido is fed. Once Fido is finished eating, the empty food bowl should be removed by an adult, so that Fido won’t be tempted to guard the bowl. If Fido is aggressive to family members when eating, this is much more of a concern, especially if there are children in the household. Children should never, ever be present when Fido is eating. In this instance, it is strongly recommended you work with a board-certified veterinary behaviorist to learn the safest techniques to prevent an escalation of Fido’s possession aggression. Often, it is recommended that the bowl be placed in front of Fido, and Fido be asked to sit or wait while you back away from the food bowl. This gives you an opportunity to create distance from Fido, then Fido can be given a command to eat while you are at a safe distance. This approach only works if Fido has an understanding of basic commands such as “sit”, “stay” and “eat” or “go get it” (release commands). 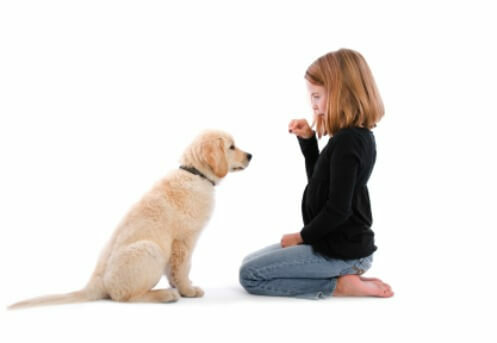 Obedience training is essential to safely implement these techniques. Please call and ask your veterinarian for a list of recommended trainers in the area, who can help with basic obedience training. Fourth, for any dog displaying resource guarding (and really any dog in general), we often recommend implementing the “Nothing In Life is Free” program. The idea behind this behavioral modification plan is that Fido needs to be asked to “work” for any reward he may receive in life (rewards are defined as food, treats, toys, affection and exercise.) In a nutshell, before Fido is to receive a treat, you will ask him to complete a task to “earn” that treat; this may be as simple as asking him to sit and wait before the treat is given. The same command should be applied to feeding; my dogs have been trained to sit and wait before they are told to eat – on occasion, we’ve gotten distracted and forgotten to give the dogs their “release” command, and found them drooling over their food bowls 5 minutes later, having not eaten a morsel of food! Fido should sit and wait before exiting the house for a walk, allowing you to walk out the door first. If your household allows pets on the furniture, then Fido should not assume he can jump up on the couch as he pleases, but wait for your invitation to be allowed on the sofa. Even demanding attention (licking your hand as you walk around the house, pawing your knees as you sit at your desk, whining for affection) is not rewarded with this program. With “Nothing In Life is Free” the dog owner initiates all interactions and all rewards- Fido is not allowed to ask, demand or take anything without earning it. For more on this program, click here. Fifth, and this is an essential rule in canine behavior, inappropriate behavior is never to be addressed with punishment of any sort. Yelling, kicking, smacking, “time outs” in a crate…these punishments are wildly ineffective for dogs and can actually make problem behaviors worse, causing Fido to become more anxious/fearful and subsequently increasing aggression. With our canine and feline friends, we want to reward/positively reinforce good behaviors and ignore bad behaviors (unless there is a danger to a household member, other pet or Fido himself.) Any trainer who recommends punishment, shock or choke collars, “dominance down” or “Alpha rolling” techniques should be avoided at ALL COSTS. In my experience, many dogs who resource guard have not been asked to adhere to enough rules by their owners. Like kids, canines need boundaries, rules and expectations! (And rewards when these appropriate behaviors are displayed.) 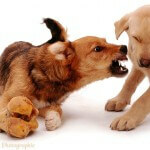 With puppies, establishing boundaries early on can often circumvent many problem behaviors described here. If dogs are taught that humans are to be respected and that there are rules in place to be followed, resource guarding can be mitigated if not eliminated. Don’t allow Fido to dictate the terms of the household! Your Dog Didn’t Kiss a Toad!